Easily Create & Share 10x10 squares from your phone, tablet, or desktop. It's free. You share squares with your guests! 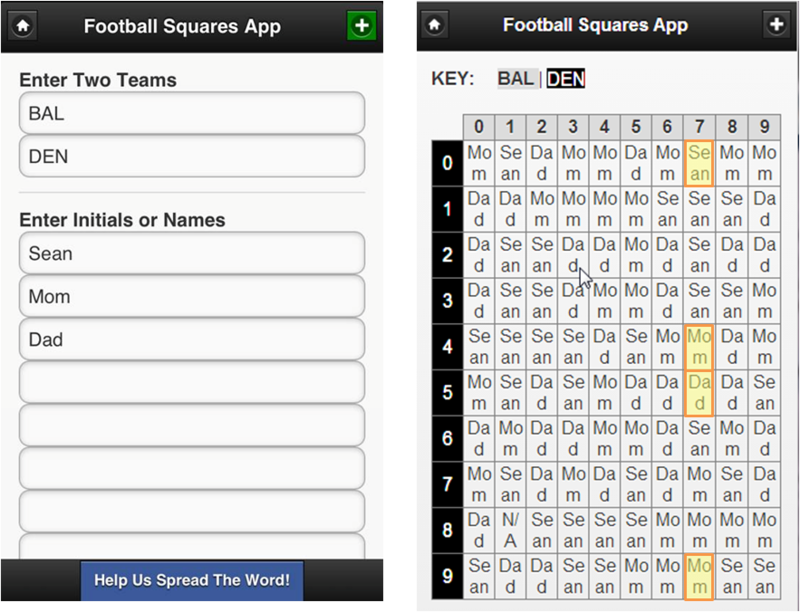 Football squares can be played during any football game. The object of the game is to have your name in the square that matches the last digit of each team's score at the end of each quarter. You start by gathering 2 or more people to participate in the game. Each person entered gets an equal number of squares in the 10 by 10 grid. The squares are randomly assigned. The numbers 0-9 across the top and down the side of the board correspond to the last digit of the score for each of the two football teams playing. At the end of each quarter, whoever has their name in the square corresponding to the score wins the prize (you determine the prize). We all anted $4, $12 total, paying out $3 a quarter. My Mom walked away $6, my Dad and myself with $3. Nice work Mom! That's it! It's simple, free, built for mobile, and best of all, fun for all with little effort!